We were there during great weather, not too hot or cold and were able to use the beautiful pool during several of the days. Very good, people on the trip were very pleased. The historical treaty signing room and the great meals in the dining room from the awesome chef. Great history, friendly people, and great cheese. Spectacular! The chateau was grand and beautifully appointed, yet warm and inviting--not at all off-putting in its grandeur. We loved the sense of history we got from the property as well. The outdoor furniture groupings were wonderful, and it was great to have the couches in the back, the big outdoor dining table, and the small table and chairs by the kitchen door. The sun in the afternoon in that spot was glorious! We also loved having the barbecue--a real one, not gas!--and we used it a lot. Though the weather was a bit cool, many in our group used the pool and loved it. The pathways through the grounds and woods were magical, and we enjoyed feeding carrots to the horse and donkey. It was great to be so close to Valogne--especially in the morning when dashing there to pick up baguettes at the boulangerie--and yet on the property we had such an extraordinary sense of peace and quiet. The meal prepared for our arrival on Saturday was superb, and Francoise could not have been more attentive to us throughout our stay. And it was a special treat to meet the Countess at the end of the week--she was so warm and welcoming. The only real negative--and this probably had nothing to do with anyone at the Chateau--is that there was no internet service upon our arrival (Saturday night) and we didn't get it back until sometime late Monday. This was a drag for one member of our group who is a translator and was finishing up a big project on deadline and absolutely needed a WiFi connection--she and her husband ended up having to book a room at a hotel in Cherbourg for Saturday and Sunday nights. Early on, a few people In our group lamented the lack of an American style stand-up shower in any of the bathrooms, but they got over it. The beauty of the fields and farms and villages, proximity of all necessities in Valogne, proximity to he historic sites of the D-Day beaches, Bayeux, and even Mont St. Michel, all of which we visited. Valogne--not walking distance, but a 10-minute drive and very convenient and quaint. The marche on Friday morning was delightful. Also a good hair salon! Amazing! Francoise was there every morning to clean and she would help with anything we needed. The first night she prepared a meal for us and it was excellent! 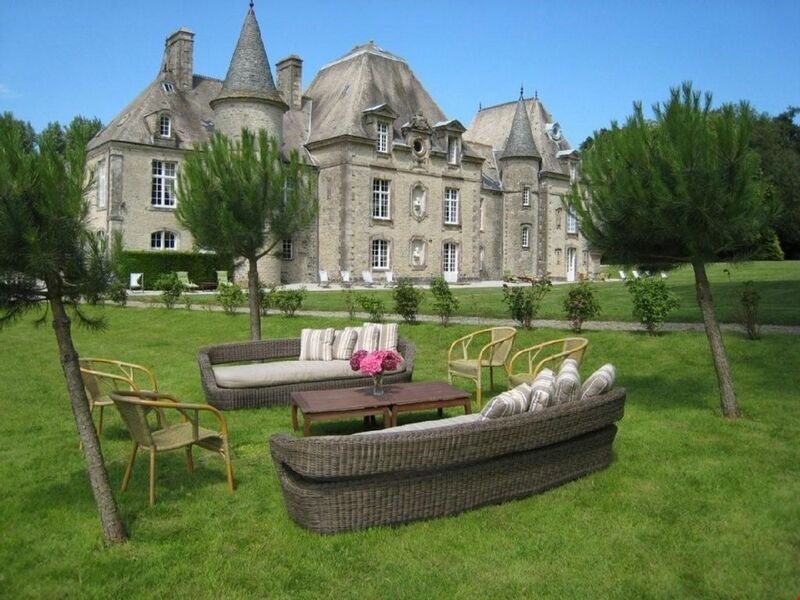 The decor and the experience of living in a French chateau! Everything - it was a beautiful location. Yvestot Bocage and yes it was in walking distance for food shopping and bakery - Valognes - a 3 minute car ride. You can find everything you need in Valognes. We used GPS with the street address and it took us right there. Security Deposit: Upon arrival at the property you are required to pay to the property representative a security deposit payable in cash or traveler's checks. The security deposit will be returned to you prior to your departure minus any extra charges or accidental damages to the property. The listed security deposit is: 3000 EUR.